This is rather a simple and fast recipe to attempt if you got the proportion of the pumpkin and flour right. 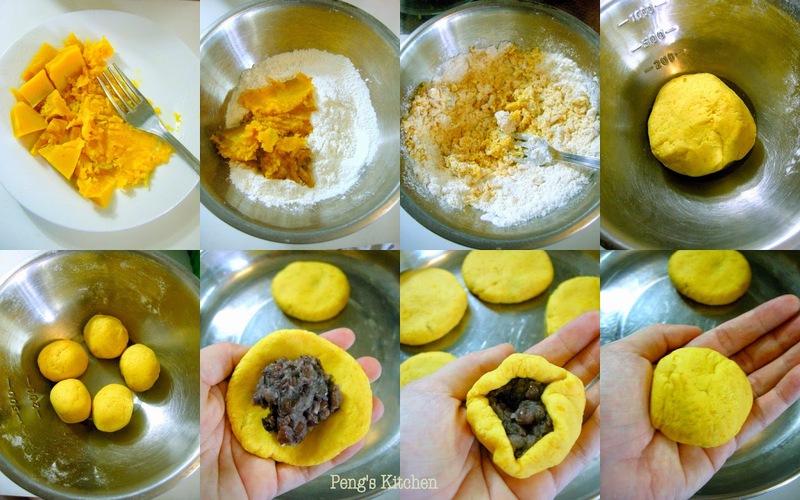 Adding too much flour at a go will result a dry dough, to rectify it you may need more pumpkin puree. The best way is to knead in flour gradually into the hot fresh puree till you get a soft, non-sticky and moist dough. Taste best while is still warm. I've kept one till next day and it still taste good without warming it up. Cut pumpkin into cubes. Cook in boiling water till fork tender. Drain away water and mash. Mix in sugar and flour. Knead till a smooth and soft dough is formed. Divide into 6 equal portions. Wrap in a about 1/2 tbsp red bean paste and seal up the edges tightly. Roll into a ball and flatten it. Brush one side with some water and coat with sesame seeds. Press in pumpkin seeds on the sides of the cake. Repeat the process with the remaining dough. Heat about 2 tbsp oil in a non-stick pan. Add in pumpkin cake and pan fry over medium heat till lightly brown on both sides. Drain well on kitchen paper. Cool down slightly before serving. wow, I have never seen this before. I like it a lot!